Building your own computer that has amazing graphics is one of the most challenging tasks, but it is worth the time and effort in the end. When building a device that is as complex as a computer, you must take into consideration a large number of factors. Also, you must make a lot of connections and think about the compatibility of the parts that you are going to purchase. Although some would say that the motherboard is the most important part of a computer, and some agree that the CPU’s quality deserves your entire attention, others would say that a great GPU makes a computer really special. Nowadays, there are plenty of pre-built computers that have powerful specs and fulfill every computer enthusiast’s needs. However, there is nothing like building your own computer and making it work impeccably. The computer market is rich in high-quality GPUs that are suitable for all requirements and budgets, yet there are some brands that are more popular than others. For instance, Nvidia GeForce GTX is at the top of every buyer’s list when it comes to building a computer that is designed for gaming and that has incredible graphics. 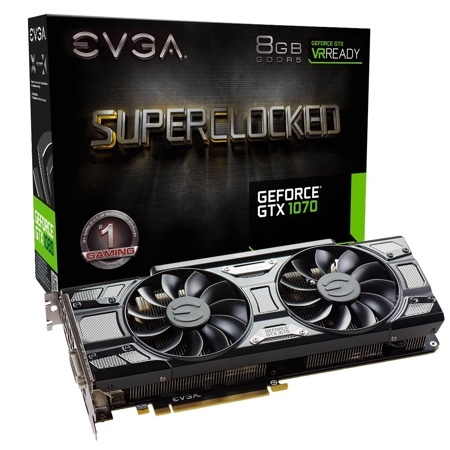 Nvidia GeForce GTX 1070 is a graphics card category that includes several models that differ slightly, but significantly, and bring users the speed and power of more advanced products at affordable prices. If you are interested in buying one of the Nvidia GeForce GTX 1070 graphics cards, you should take a look at the below products. Making such a decision is never easy, which is why we selected the three best-selling products on the market, highlighted their pros and cons, and analyzed them for you. This way, it will be easier for you to see if the product that you were most focused on is really worth your attention. If you want to buy a graphics card that is more affordable than most high-quality products on the market, you should take a good look at this product. 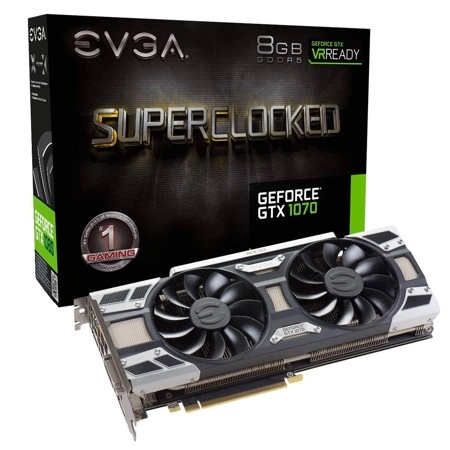 It is medium-priced, and it has great features that you will enjoy if you are a passionate gamer and want to buy a GPU from the 1070 category. This black edition has a gorgeous design, it comes with a real base clock that is set at 1594MHz, a real boost clock that is set at 1784MHz, and a memory detail of 8192MB. This product incorporates a powerful cooling system that allows you to play longer without fearing that your computer is overused. Luckily, it is easy to install and it doesn’t require installation software. It can be used as soon as you connect it to the computer. It comes with a PCIe interface, a GeForce GTX 1070 processor, and a GDDR5 RAM of 8192GB. As for its connectivity, it has PCIe x 16. Its memory bus width is of 256 bits. It is lightweight, easy to maneuver, and has a great design. It measures no more than 1.5 x 10.5 x 4.38 inches, and it weighs only 2.6 pounds. This product is a great choice if you are looking for a graphics card that is built around a Nvidia chipset. This is a high-performing GPU that can be bought at a fair price and is a great value for the money. It is power efficient, comes with high bandwidth tech, and has plenty of memory. More than that, it offers gamers a smooth experience, the best image quality there is, and the ability to see 360-degrees images, even when using virtual reality sets. This graphics card is built for Pascal architecture and is equipped with a scanner that offers users unique overclocking features and tuning. It has a RAM of 8GB, GDDR5 RAM memory, and PCIe x 16 connectivity. Its memory bus width is of 256 bits, and its memory speed is of 1594MHz. This is the ideal GPU for professional or passionate amateur gamers that want to take their gaming skills to the next level. Are you looking for a fairly priced graphics card that has a large memory, great specs, and an impressive design? 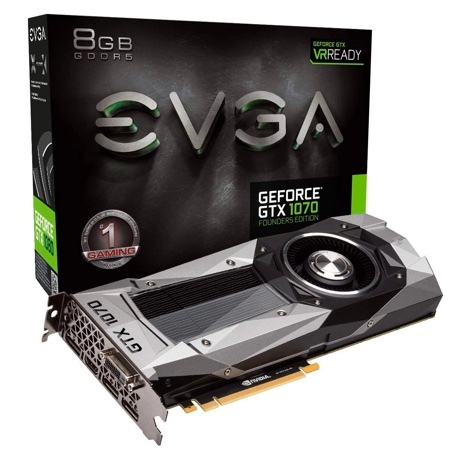 Then the EVGA GeForce GTX 1070 Founders Edition could be what you are looking for. This GPU that has a real base clock set at 1506MHz and a real boost clock at 1683MHz comes with a memory of 8192MB and an incredible speed that is characteristic for the Pascal architecture. This product includes 1920 CUDA cores, a memory clock of 8000MHz, and a memory speed of 0.24ns. Its memory bandwidth of 256.3GB/s is ideal for gaming and other similar activities. It doesn’t require any installation software, as it is ready to use right after connecting it. It only measures 1.5 x 10.5 x 4.38in, and it is easy to handle. This product’s founder’s edition is one of the best products on the market, and it has had great success ever since it was launched. By using a Nvidia GeForce GTX 1070 card, you are able to build up an incredible computer that has amazing graphics, power, speed, and performance when it comes to gaming and more. What is even more important is that by using this level of graphics card, you will be building a computer that will last and will be usable years from now. There are plenty of Nvidia graphics cards available on the market for you to choose from. In order to choose wisely, first analyze your needs and make sure that you know what capabilities you want your next computer to have. What do you need most? A good performance rate, low price, high speed, or incredible graphics? How much are you willing to pay for a good graphics card? What kind of operating system will you be using? Is the card that you are interested incompatible with the other parts of your computer? What type of RAM will you be using? Is the graphics card compatible with the motherboard? Always check the specifications of a graphics card before buying one, no matter how amazing it sounds or looks. You don’t want to buy one that is weaker than advertised or that is not compatible with the other parts that you already bought. More importantly, don’t forget that graphics card manufacturers invest a lot in marketing strategies, so don’t let yourself be fooled by ads. Do your own research before investing in a product.